Greetings! Welcome to Fairies!! Where we do Beleive in Fairies!Please Login or Register! ...And if this is Annoying,Let an Administrator Know Please! We will watch you sleep at night. New: Upload Pictures Of Fairies and yourselves in the Gallery! you can find it in the NavaBar Above. Find out More about it in the Babbling Brook Category. Congratulations to SeeminglyDazed for Being Fairy of the month for the month of July!We thank her for all the Creativity She brings to the site. Congratulations to KarenaTheFreak for Her poem being chosen as the Poem of the Month of August. Alright Members our RolePlaying Section is up and running! Check it out! especially the one called "The Fairies"! The Fairy of the month for the month of August is Skyes'TheLimithun[;! She is our a great poet Fairy! Shes a sweet kind fairy too! and she is an excellent Roleplayer too!! Congratz Love! You deserve it! » The Fairies Elimination Game~! » What Really Happened Last Summer? 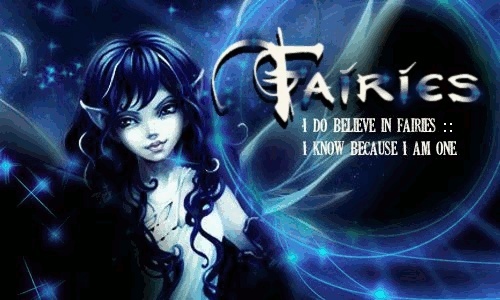 The Fairy Council is a very Important to our site. They Help welcome the Season and See it makes a Safe leave. They Perform these duties At the Beginning of each New coming season. If you think you can handle that responsibility Send an Application to of your Admins. Please Congratulate Mari Chan For Winning the Ambassador of Spring election!We wish her good luck next year! You dont necissarily have to use the generator! you can make it up all on your own! You can Even make up your Fairy Bio! Make up A fairy name!! And her charcteristics! And Also check out Your Fairy Name(Charcters Sheets) In your Profile! We will be having a special Fairy Ceremony to welcome in the season! Stay tuned for more info! There is now a Gallery so Upload as many pictures Of Fairies and of yourselves as you want!Please Keep in mind that the Photo's will be approved by an Admin,and then you can Let your Fellow Fairies comment and rate them! and we shall have a contest on The Most popular fairy of the Month!